Edward M Richardson. ANWS (1810-1874) landscape painter and watercolourist. Son of TM Richardson. 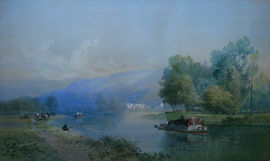 Exhibited at the RA in 1856 and 1858 but mostly at the NWS 187 works of which he became an associate in 1859 the year this was painted. Painted landscape in England Scotland and Europe in a picturesque style similar to his brother TMR Junior. A sale of his watercolours was held at Christies on Feb 19 1864; his studio sale was held there May 25th 1875. He exhibited Royal Academy 2, Ridley Arts Club 67, New Watercolour Society 187.